Apr. 17 - Video: "You Really Have To Try It!" Apr. 11 - Saturated Fat is Your Friend! Mar. 14 - Rugged Cliff and Sensible Originals! Feb. 19 - Video: The Best My Skin Has Ever Looked! Jan. 31 - Free Shipping is a Hoax! Jan. 16 - "A Natural Deodorant That Really Works!" Dec. 5 - Our Products Are Now Available in Canada! Nov. 26 - Help Us Out On Pinterest! August 15 - $25 OFF For Doing a Video Testimonial! July 24 - Take Years Off Your Face, and Axe Acne! July 19 - Best Thing for Skin From Head to Toe! June 7 - Tube Tallow Balm - Lip Balm and More! May 17 - The Only Product Your Skin Craves! Whole-body natural skin care for face, lips, hands, feet, and body. The purest, most natural ingredients of any skincare product (see organic Product FAQ). For healthy skin. For great-looking skin. For all manner of skin conditions. Our Tallow Balm is soft, spreadable, and easy to use. This is how people cared for their skin before chemicals. This is "The Whole Food of Skin Care". There is nothing else like it on the market. In fact, we invented the term, "Tallow Balm". People also call it tallow cream, tallow salve, and tallow lotion. Don't put anything on your body that you wouldn't put in your body! 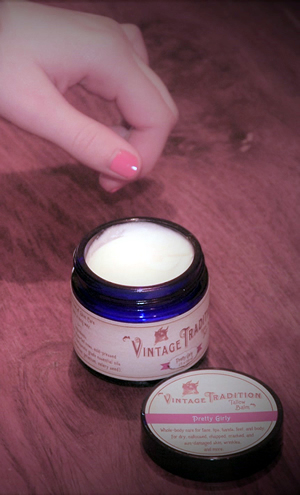 If other skincare products have failed you, you owe it to yourself to try Vintage Tradition! Keep tightly capped and at room temperature. A little goes a long way, so a jar lasts an incredibly long time. It does not result in a greasy look or feel because it is readily absorbed as nourishment. Our Tallow Balm has only three whole-food ingredients, all selected from the finest sources to ensure its superior therapeutic quality. It is chemical-free and GMO-free with nothing unnatural. *In the case of Tallow Balm with Green Pasture™ Oils, the olive oil is replaced with Blue Ice™ Fermented Cod Liver Oil, Blue Ice™ Fermented Skate Liver Oil, and X-Factor™ Gold Concentrated Butter Oil, making these balms the only all-animal-oil skin care and muscle and joint products available anywhere. During production, our balm does not come into contact with plastic, aluminum, or non-stick surfaces. Our Tallow Balms are handcrafted in Colorado Springs, Colorado, USA. We offer a guarantee on our Tallow Balm. Order Deodorant Tallow Balm here. Our natural Deodorant Tallow Balm has the exact same whole-food ingredients as our Tallow Balm but with carefully chosen essential oils to make it an even better natural deodorant. It is a paleo-friendly deodorant. The longer you use it, the better it works. It has a cumulative effect! It is readily absorbed and doesn't just sit on top of the skin, so one application can last more than just a day! Unlike with other deodorant formulations, any left on your hands can be applied anywhere. Just rub your hands together, and nothing goes to waste! Our natural Deodorant Tallow Balm has only three whole-food ingredients, all selected from the finest sources to ensure its superior therapeutic quality, with no chemicals, no GMO's, and nothing unnatural. It is an aluminum-free deodorant. One of the naturally occurring oils in tallow, palmitoleic acid, has natural antimicrobial properties, which helps fight odor-causing bacteria, and the added essential oils increase the protection against odor. Our Deodorant Tallow Balms are handcrafted in Colorado Springs, Colorado, USA. We offer a guarantee on our Deodorant Tallow Balm. Order Tube Tallow Balm here. Our Tube Tallow Balm has the exact same whole-food ingredients as our Tallow Balm. Use on lips or anywhere! Convenient for on-the-go use, especially as a soothing natural lip balm for dry, chapped, and cracked lips, providing ultimate moisturizing. The same whole-food ingredients as in our other balms—can also be used on skin. A great value! More than 3 times the amount of balm of regular plastic tubes*, fewer applications needed, and much less needed per application, so one tube lasts an incredibly long time! Environmentally friendly, sturdy paperboard tube made from recycled paper with virgin-paper inner lining (so Tallow Balm doesn't come into contact with recycled paper).